After a long winter of collecting new backpacking gear and reading guide and how-to books, I couldn’t wait to get out on the trail. 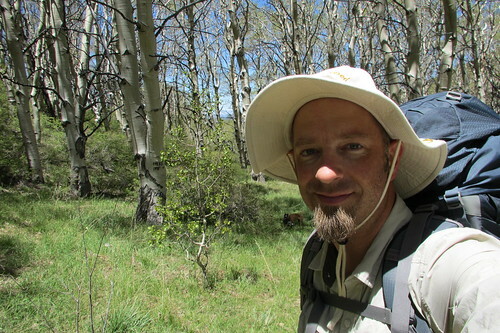 I chose the Arc Dome Wilderness for my first backpacking trip of the year. 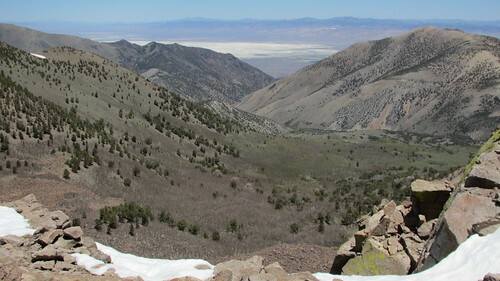 Solitude, no bears, no permits, high elevation, and rugged country drew me to this remote location in the Toiyabe Range of central Nevada. 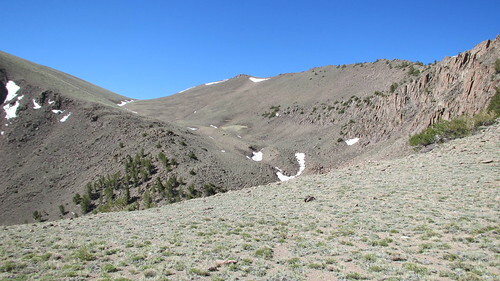 I chose to enter the Arc Dome Wilderness at the Stewart Creek Trailhead. 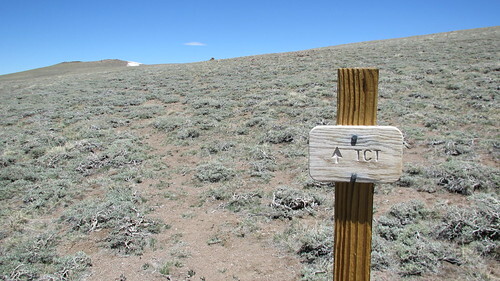 The trailhead is very remote, but not hard to find. 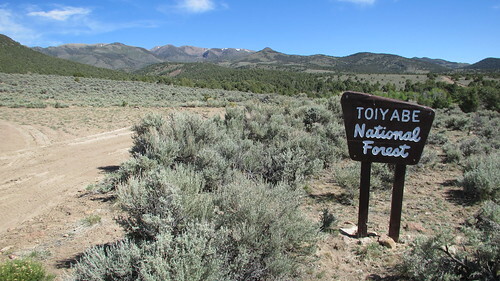 About 50 miles south of Austin, at the south end of the Reese River Valley where HWY 21 and 844 meet, there is a signed turnoff to the Columbine Campground to the east. While these dirt roads may look complicated on a map, all intersections are either signed or it’s pretty obvious which one the main road is. Although the graded dirt roads of HWY 21 and 844 are easily passable in a passenger car, the dirt road up to the Columbine Campground has a couple creek crossings that may give low clearance vehicles trouble. Even though I had concerns about taking my old SUV out on a road trip, I was glad to have it for the end of the drive. Shaded under the aspens along Stewart Creek, the 8,600 ft. elevation Columbine Campground would make a great destination in itself. 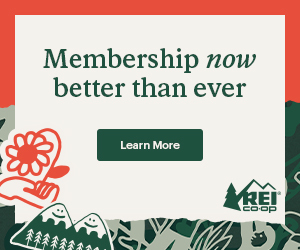 There are no fees to camp or park here. There are pit toilets, but no water except for the creek. 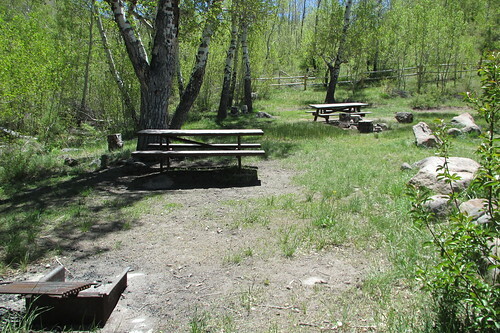 The sites are nice with fire pits and picnic tables, and only two of the seven were occupied when I arrived. Getting a late start from Carson City, and not arriving at the trailhead until 5:30 PM, I didn’t have much time to explore the campground before getting on the trail. I parked my car, grabbed my pack, leashed up the dogs, and headed for the trail. I had to get up above 10,000 feet and find a suitable campsite before sundown. Even though the sun sets late this time of year, I was still a bit concerned, and had regrets of getting such a late start. I would have to push my pace and make good time. I had a brief chat with the campers at the Columbine Campground before setting out. They probably wanted to get a better look at the guy that was already getting tangled up in dog leashes before even setting foot on the trail. 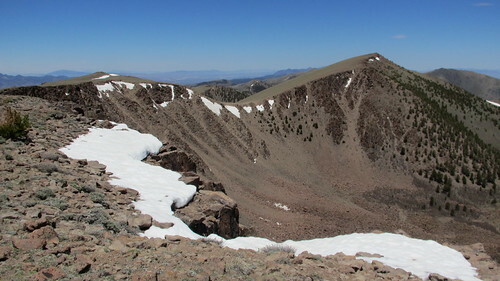 They said they planned to hike Arc Dome the following day, and said they might see me up there. 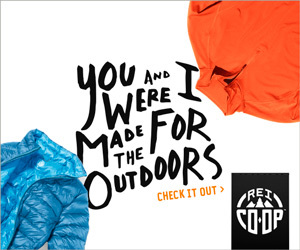 Immediately upon hiking, I knew I had packed just a little too much stuff. I was pretty happy with the weight of my pack early in the packing process, but in the end, threw a few more things in just in case. I had way more food than I needed, and the backpacking field guide that I never looked at once the whole trip probably pushed the pack weight just over the edge of being comfortable. Not only that, but my old car doesn’t completely lock, and I didn’t want to leave any expensive items behind. It all went into the pack. Luckily I had my brand new Osprey pack for this trip, and it carried the load quite comfortably on my body. Just a short ways up the trail, I made a left onto the Stewart Creek Trail, crossed the creek on some stepping stones, then began my ascent up the canyon. 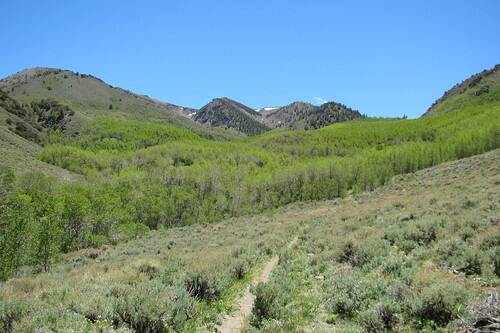 The trail becomes steep at times, but it always stays interesting, alternating between low sagebrush with wide open views, and then back into the cover of the aspens. Occasionally the the trail would just disappear in the Aspens. Sometimes you’d encounter an old signpost, but the sign was long gone. These trails were constructed in the 1930s by the Army Corps of Engineers, and some sections look as if they haven’t been maintained since. The light foot traffic seems to be just enough to keep the trail from fully going back to nature. In spite of this though, I never once strayed off the trail. It follows an obvious path. It was a bit disheartening at times looking up at the pass I had to climb to get to camp. I frequently checked how long I had until sundown, and knew I’d make it if I just kept my rests short. 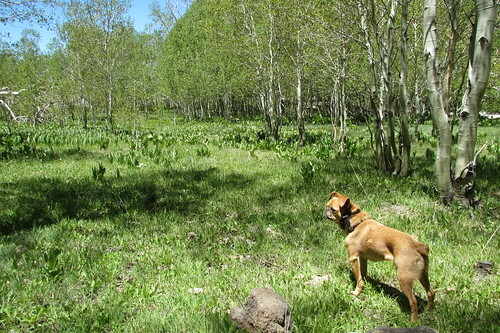 The dogs were having a much more easy time than me though, running back and forth along the trail, and frolicking in the cool grasses in the aspens. I did my best to keep them close though, just in case there was a mountain lion in the area. 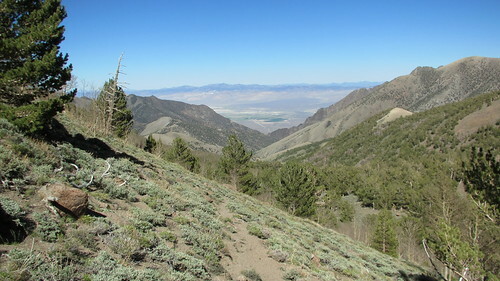 Once I merged with the Toiyabe Crest Trail, the hiking became a bit easier as the trail leveled out some. I could see the pass up ahead, and the camping area was just down the other side. 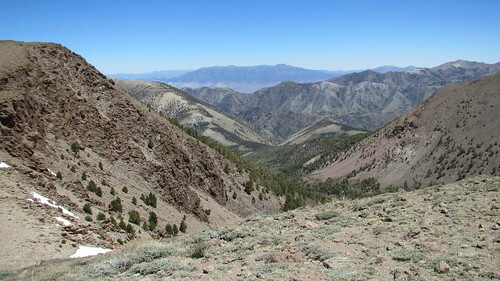 Reaching the saddle felt great, and I was rewarded with great views of the canyon I had just ascended. I still had plenty of daylight left, but the shadows were starting to grow on the east side of the mountain. We continued down a few switchbacks to the cutoff for the North Twin River Canyon. The guidebook said there was decent camping in the North Twin River Canyon, but I didn’t know how far down I’d have to go to find a good place to camp. 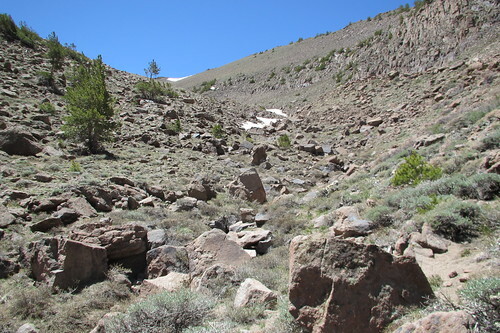 Much to my relief, there was a fantastic site just off the trail junction under the pine trees. 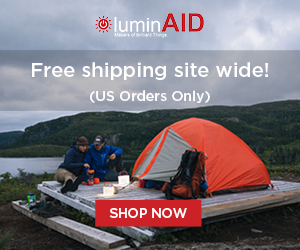 There were several level spots to pitch a tent, a fire ring, and even a stack of firewood! I quickly got my camp setup and fixed myself a hot bowl of noodles. It felt great to finally relax after a long day of travel. After dinner, it started to get pretty chilly so we made our way to the tent. I knew it was going to be a cold first night, so I was prepared. The temperature in Austin was forecasted for the mid-30s, so I knew it would probably be in the 20s up at my camp at 10,300 feet. I normally don’t put my fleece jacket on unless it gets really cold before the sun comes up, but I put it on before midnight even rolled around. 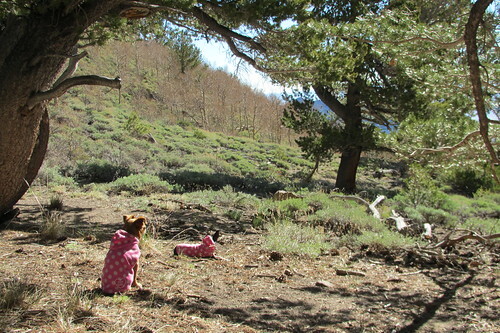 My little dogs were in their fleece jackets and stuffed in the sleeping bag with me. I wouldn’t say we were cold, but we weren’t necessarily comfortable either. It was a restless night. At one point the tent got really bright, and I knew the moon was out. Even though I bet it looked spectacular, I didn’t want to get out of my sleeping bag. I was thankful when morning finally arrived. The rising sun warmed up our tent, and I was able to get a couple more good hours of sleep before finally getting up. 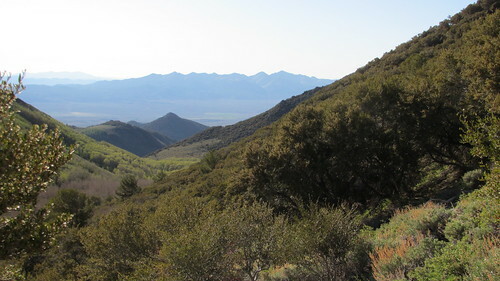 After a breakfast of cold cereal and dried fruit, and enjoying the views of the Big Smoky Valley to the east, the next mission was to find water. The drainage I was camped by was dry. According to my topo map, I had a 1,000 ft descent to reach a spring down the canyon. It was possible I’d run into water before that, but didn’t want to waste the energy if I didn’t find water. I new there was water back over the saddle at the top of Stewart Creek, and it wasn’t too far away. I hated to backtrack, but it was a sure thing. Melting snow was another option, but seemed too time and fuel consuming. We loaded the pack up with just the water bottles and filter, and headed back to the north in search of water. The original plan was to hike south to Arc Dome that morning, so the extra couple miles of hiking to get water changed things. Additionally, I think the high elevation was making me feel a bit weak. I knew I hadn’t stayed well hydrated either, adding to the lazy feeling. The dogs and I didn’t have to travel far off trail to reach the creek. 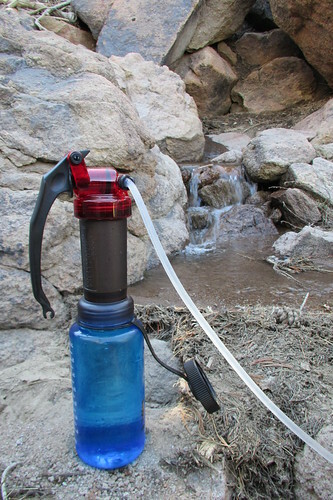 I drank a liter of water, then filtered 3 liters to take back to camp. For the next trip, I plan to have a 4-6 liter roll up water bag. It would be ideal for a trip like this when you have to take advantage of the water when you find it. Extra water when you need it, but the bag rolls up small when you’re not using it. We had a good snack when we got back to camp then decided what to do next. 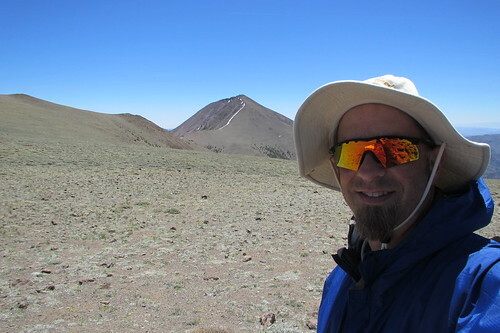 I knew summiting Arc Dome was not a realistic goal for the day, but there was still plenty of time to do a shorter hike in that direction for some great views of the mountain. 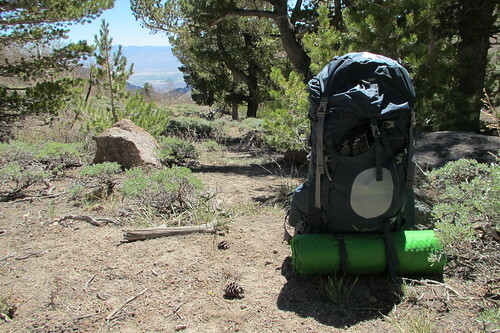 I took the day pack off my backpack, filled it with water and snacks, then we began our ascent south up the TCT. 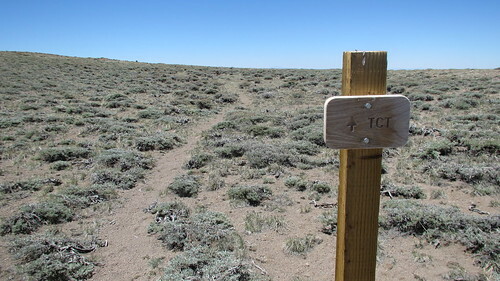 The trail along the TCT to get up to the high plateau was steep, rocky, and barren. My first thoughts as we climbed were that I really didn’t want to come back this way the next day with the full pack on. It was hard enough with just the day pack. We passed many patches of snow as we climbed, but none were showing signs of melting at the time. Before too long we made it up to the plateau. Views to the east were quite incredible, with rugged mountains, deep canyons, the Big Smoky Valley, and Mount Jefferson way off in the distance. The plateau itself though was easy hiking, although the trail disappeared at times. It was still simple to navigate though, as periodic rock cairns marked the way. 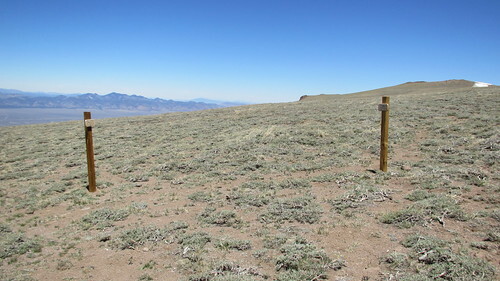 The view to the west was expansive, but looking across the plateau, it didn’t really seem as if you were really at 11,000 ft elevation. Only the dwarfed sagebrush looked a bit odd. Periodically, large grasshoppers would catch the wind and slam into my jacket. 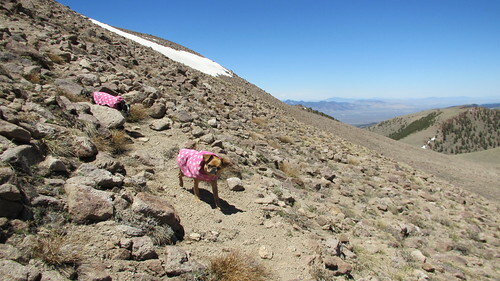 The dogs and I hiked on south to Arc Dome, and stopped just north of the saddle before the peak. There was an outcropping of rocks here, and someone had made a nice wind break. It would be possible to setup a small tent here too if you needed to. We decided to end our climb here and have lunch. I thought I might be disappointed not getting to summit Arc Dome, but just sitting next to it wasn’t bad at all. The hike along the crest was magnificent as well. That alone was worth the effort of getting up there. 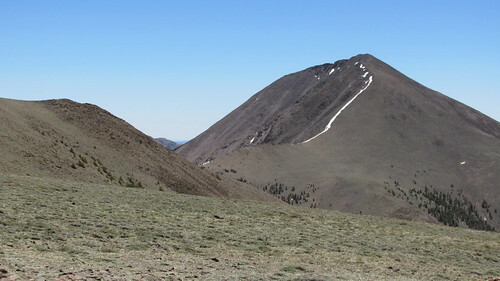 As we ate lunch, we saw two hikers on their way back from the summit. After a nice long lunch, we started to retrace our steps. Near the trail there is a big bowl off to the east. We hiked over to the rim and peaked over for a good view of all the canyons below. There is so much to explore out there! As we made our way back down the canyon, the snow had begun to melt. It was warming up, and you could now hear and see a little trickle of water beginning to form at the bottom of the canyon. Coming down the steep canyon, I decided to alter my original plan of doing the hike as a loop. Instead of going back up to the plateau in the morning, I’d just hike out the way I came. I had done some great exploring of that area that day, so there wasn’t a big need to make the climb again. Going back the way I came only involved a short climb in the beginning. This plan started to sound really good. When we got back to camp, we met up with one of the hikers we saw coming down from Arc Dome. It was one of the guys I had met the day before at the trailhead, a guy named Dave from eastern Oregon that was out touring the west. He said he had just gone a bit further than we had, and didn’t make the summit either. Like myself though, he was not disappointed, and was just enjoying the hike. 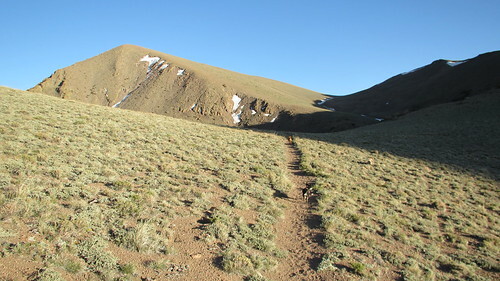 He had come up the other trail and had asked me if he was on the right track to get back to the Columbine Campground. I was pleased to tell him that he had one simple climb and then a long descent back to camp. 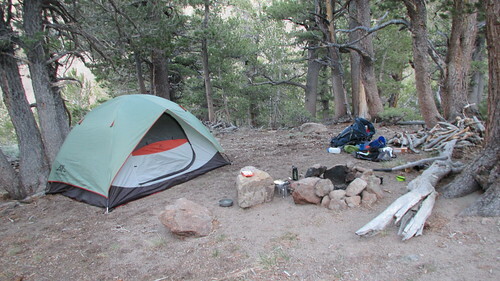 Before departing, Dave had offered me beer back at camp if I was planning to hike out that night. It was an offer I seriously considered, but then decided I would stay right where I was for another night. I had a nice long afternoon of relaxation ahead of me, and it was sounding good. I still had a little over 2 liters of water, enough water for the night, but I thought I’d explore the North Twin River canyon a little to see if there was any water visible further down. 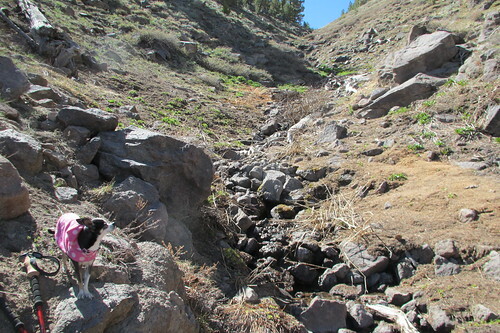 We made it to a switchback that descended to the bottom of the canyon, and started to hike down. After a short time I looked back and only one dog was with me. The Chihuahua was back at the switchback corner sitting down, telling me she would go no further today. The other dog and I walked a bit further to see if she’d change her mind, but she didn’t move. 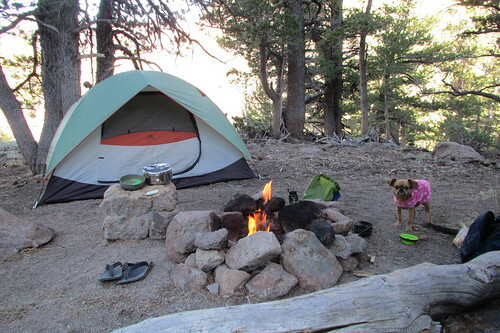 The dogs had already put some good miles in that day, so I decided to head back to camp. Relaxing back at camp, I started to hear the sound of rushing water in the canyon below. I walked over to the edge, and sure enough, water was now flowing! Those snow banks we saw earlier up above had melted enough to create a little creek. We grabbed all the bottles, filled them, drank some more water, then topped them off again. Now this may sound rather mundane, but being out there in the wilderness, with the closest water source a good hike away, this was very exciting to me. Life back in Carson City had started to fade away, and simple pleasures and tasks were well enjoyed. Later in the afternoon, I thought I’d build a fire. There were no fire regulations at this time, and it would’ve been a shame to not use the nice fire ring and plentiful firewood. I gathered pine needles and pitch for tinder, and small twigs for kindling. Whoosh! It started burning quite easily, almost too easily, and I had a nice fire going in no time. It was a good reminder of how easily a forest fire can start. I decided not to use the larger stacked wood in camp, and instead used smaller sticks about the diameter of my thumbs. 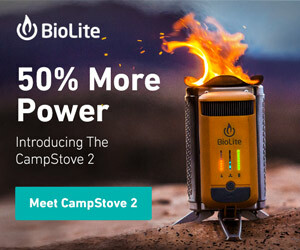 I kept the fire small and controlled, so it would burn out quickly after I stopped adding fuel. 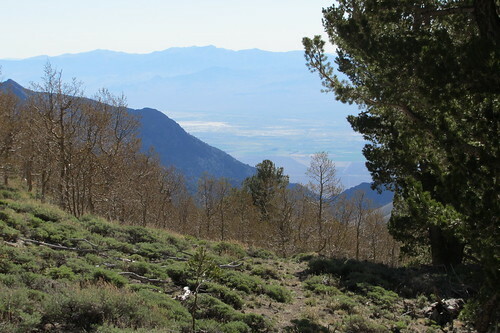 I didn’t want to be the guy who burned down the Toiyabe National Forest. We enjoyed the warm fire through dinner, some journal writing, and book reading, then let it die out before bedtime. Because of the limited available water, I kept my meals simple, sticking to noodles, salami with cheese and crackers, instant oatmeal, and dry cereal with powdered milk. I had brought ingredients to make burritos, but that would’ve used too much water for cleanup after cooking the beans and rice. On the bright side, I conserved a lot of cooking fuel, since it only took a few minutes to boil water for my meals, coffee, and tea. The second night was slightly warmer, and I slept much better. We waited in the tent until the sun had warmed things up a bit and then began our leisurely awakening. That is until I found a tick crawling up my leg as I was changing. I opened the tent door, and tried to flick it out, but I missed and it bounced back in the tent somewhere. After a bit of searching, I found it again, but this time carefully put it outside the tent and killed it. 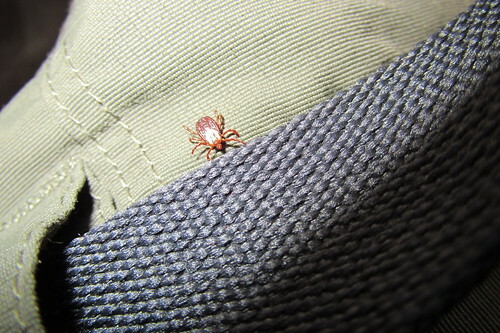 The next several minutes were spent going over my body, my clothes, and the dogs, but no more ticks were found. I think it must have just spent the night on my pants that were beside my sleeping bag. The dogs enjoyed a leisurely morning sunning themselves as I made breakfast and started packing up. After I rolled up the tent, I found that I had been sleeping on top of an arrowhead the whole time. It looked to be made of flint, and had the tip broken off. It was kind of neat to think that this spot had been used for camping for hundreds of years. After getting my pack all loaded, we hit the trail. We had just 1/2 a liter of water left, but it wouldn’t be long before we hit Stewart Creek. Between the light water load, and eating a lot of the food, the pack was feeling more manageable. We hiked back up to the saddle above camp, crossed a snow bank, then began our descent down to Stewart Creek. We stopped at the creek where the trail crossed it and had a nice break. The dogs and I had some snacks, then I filtered more water. I drank plenty at the creek, then filtered more for the drive home. 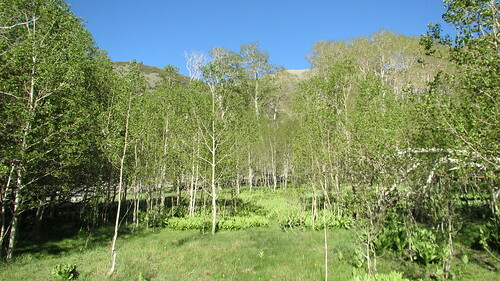 Shortly after the break at the creek, we were back into the aspen grove. All along the trail people have carved their names and dates. Some dates were more recent, but the oldest one I found dated back to 1934 from Henry Aberasturi. A Google search found a Henry Aberasturi that was born in Spain in 1895, and was living in Eureka, NV, working as a hired hand in 1940. Maybe Henry was one of the original trail builders. 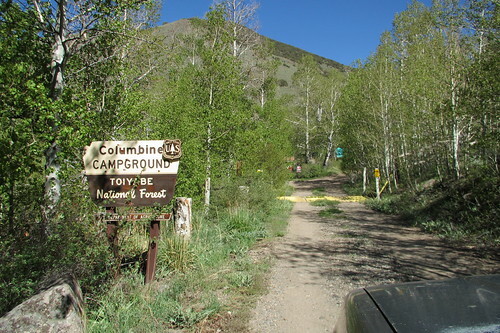 Before long we were back at the Columbine Campground trailhead. I had leashed the dogs before we entered the campground, but there was nobody there when we arrived. The dogs seemed pretty happy to be back, and eagerly hopped into the car. I scooped them up some creek water in their bowl, then changed into shorts and a short sleeve shirt. I was quite a bit warmer down below 9,000 feet, and I imagined the desert below would be really warm. I wouldn’t have minded spending the day and another night in the Columbine Campground, but I was expected back that evening. Cell phone signal was still 1 or 2 hours away by car, so there was no good way to change my plans. After studying the map, I decided to return on a different road. Considering how far south I was, the road to Ione and then Gabbs made more sense. 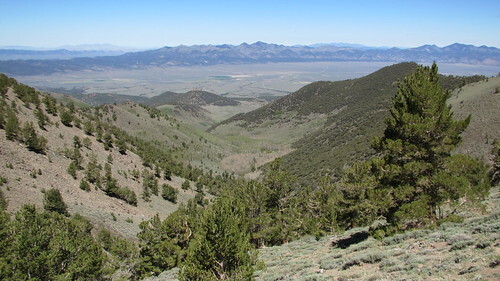 There would be less backtracking than going back up the Reese River Valley, the way I had come in. 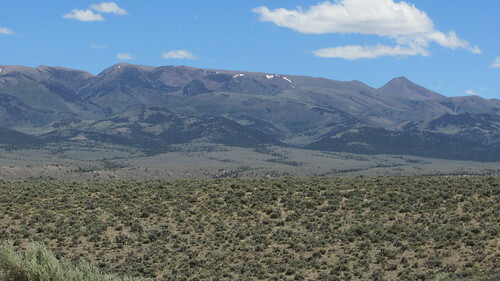 We had some great views looking back at Arc Dome as we headed into the mountains to Ione. It was a great adventure. Not everything had gone as I had planned, but it turned out ok. I got to try out some new gear, learned a few more things, and built some confidence. There was much to reflect on as the dogs and I made the long drive back to Carson City, snacking on leftovers and listening to Johnny Cash. More photos from this trip in the Flickr Photoset. This trip was done June 6-8th, 2012. I felt like I was there with you! Next time. 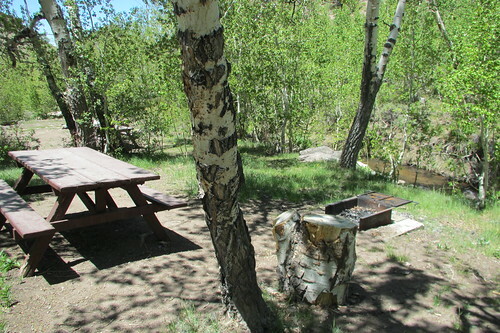 Columbine Campground is nice — we were there in May for the annular eclipse. Can’t beat rural Nevada! 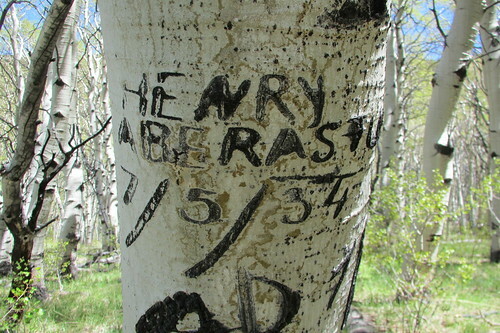 the earliest tree carvings in the aspen grove on the Stewart Creek Trail date to the early 1920s. These were made by Basque sheep herders who were active in the Toiyabes until the 1970s. 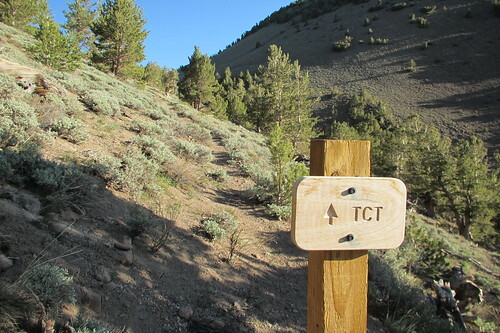 The trails are historic, not made by the Army or the CCC as sometimes reported. 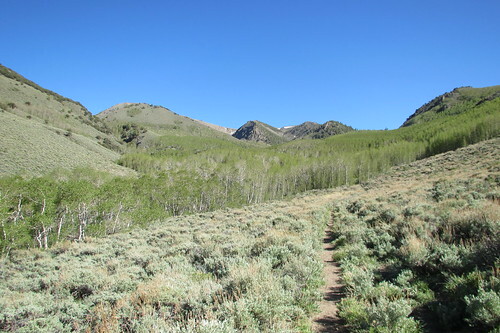 Trails were developed by Native Americans, then miners and stockmen. I wish those bums never carved into those trees. most think it is a desolate wasteland. I enjoyed your Arc Dome summary very much Thank you. You cant seriously think thats going to stop a determined thief. You must be one of the lucky ones never robbed. I wish you and the pups many more safe adventures.